Snowdonia has such a wide variety of walking, enjoyable by all - there is everything from gentle strolls along estuaries, more adventurous walks in forests and around mountains with fantastic views, to the climbing of Snowdon, the Arans and Cader Idris. 1. 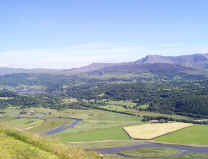 Precipice Walk - a 3-mile walk with incomparable views of the Mawddach Estuary and valley, the peaks of the Cader Idris range and beautiful Llyn Cynwch. As the walk follows a contour it is not a strenuous climb and can be enjoyed by almost everyone. 2. Torrent Walk - a circular walk enjoying the tumbling falls of the Clwedog river through broad-leaved woodlands with an abundance of ferns and mosses. The walk can take in a visit to St Mark's church with its unusual altar front and returns down the other side of the gorge. 3. New Precipice Walk - a short flat walk of just over a mile up to a circular walk of 7 miles depending from where you start. 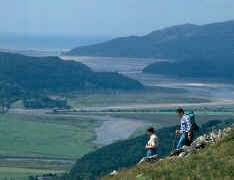 Fantastic views of the Mawddach Estuary and across to Cader Idris and the Arans. 4. 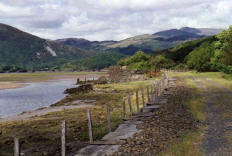 Mawddach Estuary - a flat walk along the old railway line from Dolgellau to Morfa Mawddach, a total distance of about 10 miles. 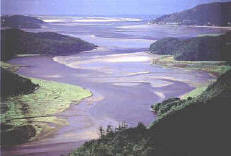 Join and finish where you wish and make any number of detours into the hills to see Cregennan lakes and more waterfalls. 5. 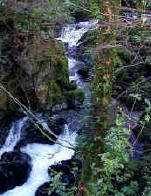 Beddgelert - many walks around this beautiful village situated below splendid mountain country where two rivers meet. Also several waymarked paths in Beddgelert forest, a mile to the North of the village. 6. 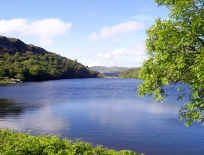 Crafnant Lake - near Trefriw. Many walks around this and other splendid lakes in the area. Some of many Forestry Commission forest trails marked out for walkers to enjoy the peace and quiet of the National Park. 7. 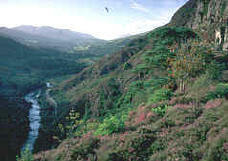 Cader Idris - at 893m high this range dominates the Dolgellau area giving splendid views in all directions. 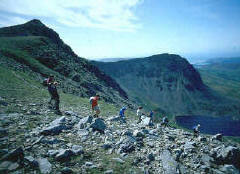 There are two main paths up to the summit and are a must for more adventurous walkers. 8. Snowdon - the highest mountain in Wales with no less than 13 paths to the summit. The views, on a clear day, are fantastic to the Isle of Man and the mountains of Wicklow in Ireland.